Victory and records, more records. Manchester City is already a Premier League champion but it is still perfecting its season. 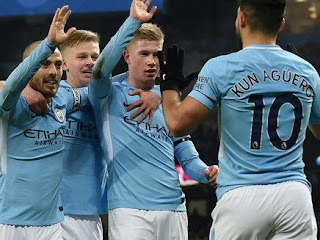 Thanks to the victory against Brighton 2-1, those of Pep Guardiola have broken the record of goals scored in the same campaign (105), the record of points (97) and the highest number of victories during the competition (31). The last time a team scored so many goals was Chelsea in 2009/10 (103) and the team that to date had the record for points were also the 'blues' during the 2004/05 season (95). Those statistics are already part of the past in the Premier League. As has also been left behind the data that broke Chelsea in the hand of Conte during the 2016/17, with its 30 victories in the championship. Pep Guardiola used the clash against Brighton to honor Yaya Touré in his last game at Etihad Stadium, and also gave him the captain's armband. In addition, others less common like Zinchenko or Danilo also had minutes. Silva, Otamendi, Walker or Stones did not enter the squad and De Bruyne was a substitute. Soon Danilo opened the scoreboard. The Brazilian received a magnificent pass between lines of Sané and defined before Ryan to perfection. However, the Brighton reacted quickly and Ulloa, head, took advantage of Claudio Bravo had gone to the side of the area to make the draw. In each ball played by Yaya Touré, the audience asked for a role for the Ivorian. That kicked from afar. That gave a perfect pass. That it would shine on his last night. But it was again Sané who, with his 14th assist of the season, served a ball to Bernardo and he nailed it on the short stick to make it 2-1. The third arrived in the same way. A pass from Sané with which he matched De Bruyne as Premier League assistant and Fernandinho's first shot, inside the area and in the second half. In the final moments, with the result already closed, Guardiola removed Yaya Touré to receive the standing ovation of the entire stadium. The Ivorian said goodbye. Also came the young Brahim and Nmecha, in addition to Mendy, who returned to have minutes, to close a placid night and records in the City. Reaching 100 points or overcoming that barrier has become an iconic milestone in European football in recent years. Although the Barry Town in Wales got it twice in the nineties and Celtic did the same in Scotland at the beginning of the 21st century, it was not until the 2011-2012 season that it acquired a special value. That year the Real Madrid of Jose Mourinho needed to establish the record of 100 points to break the hegemony of Barcelona in the Spanish League. The Catalan team did not want to be left behind and reached the same number the following year, while Juventus repeated the trend one season later, reaching 102 points. To join that select group, Manchester City must beat Southampton on Sunday.